Edited: I decided on a name. I am amazed at all the variety you cane up with. From gardens, to basketball, baseball, outer space, tv, love, etc. I appreciate it so much. I also like having your eyes for a minute. It makes me take a second look at the pattern itself. I had personally wondered about something with "big stitches" as those red and white things make thing of quilting with "big stitches". But I've decided on "Going in Circles". This quilt top is so busy with a lot going on in it - so that title does seem appropriate! (It was suggested on the Facebook group by Melanie Summer Folk! I appreciate all of your help. I need another name! Can you help me once more? I really only have a couple more of these for now that I'm stuck on name with. I value your suggestions and help and appreciate your fantastic ideas! I love having your brains to bounce ideas off of! Here are a couple more pictures in case they give you some ideas for a name. Around the outside, I purposely put a piano key border simply to see try to use up all the rest of the name labels - of which I had quite a few left - I wasn't able to use them all up in the Premium Labels quilt! 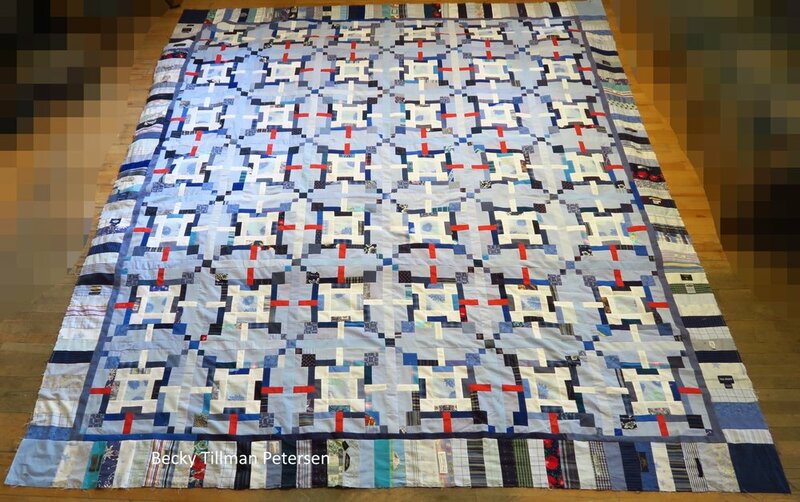 If you will help me with name ideas, either here in the comments, or over on the Facebook group - Quilted Twins: Scrap Quilting and More with Becky - I'll decide on Monday and get the pattern available shortly after that. Monday I will be gone a good bit of the day helping someone, so it might be late on Monday before I actually decide. The pattern is available now that I decided on a name! It's here. I hope someone can use it. Note: You can see that my pieces are getting somewhat smaller. That's because at this point (#36) most of the available pieces of fabric are now much smaller than previously. I do have some left in my lights box and even my dark box, but I'm trying to use up the various and misc. pieces I have lying around. Don't forget - you can always keep up with the current status of this project here. And that's what's been happening in my part of the quilting world today! Be sure to check out what my sis has in the store! Aren't these fabrics nice? Look at those pigeons...those of you who do Bonnie Hunter mystery quilts always need "neutrals" and that would be a fascinating one to use in a quilt as one your background fabrics. At least I think it would be a nice "different" fabric to use.